As the Birds first round draft choice, Agholor has a lot of work ahead of him and is going to go through the ups and downs of being a rookie. That said, the former University of Southern California star gave Eagles fans a glimpse of the upside of his potential. 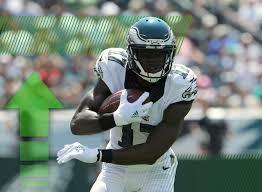 In the Eagles 36-10 preseason win over the Indianapolis Colts last Sunday, Agholor caught five passes for 57 yards including a spectacular 34-yard touchdown pass in the first quarter that thrilled the Eagles faithful at Lincoln Financial Field. On his touchdown, Agholor hauled in a short, overthrown hitch pass from Eagles quarterback Mark Sanchez and just sped past defenders for a touchdown. If there’s one thing that has stood out about Agholor from the time he was drafted to his first preseason game on Sunday, it’s that he doesn’t go around tooting his own horn, at least not yet. He’s the first to acknowledge his own mistakes. He had a couple of drops that cost the Eagles a couple of third down conversions. During his career at USC, the 6’1”, 190-pound Agholor played in a variety spots at the wide receiver position at both the slot and as an outside receiver. He put up numbers no matter where he played, especially in his final season with the Trojans. Agholor caught 104 passes for 1,313 yards and 12 touchdowns. Eagles head coach Chip Kelly said the thing he liked about Agholor when he was at USC was his ability to run after the catch. The touchdown that Agholor scored Sunday against the Colts was a classic example of why the Eagles drafted him. Agholor is also showing that as a rookie that’s important for him to be a student of the game and that each situation, whether it’s practice, the film room or a live game, every situation is an opportunity for him to make his game better. If Agholor wins the starter’s job as a starting wide receiver, the Birds are going to have a pretty decent group of receiver when you throw Matthews, Miles Austin, Josh Huff and Riley Cooper into the mix.